Baylisascaris procyonis, aka the raccoon roundworm, is a ubiquitous roundworm found throughout North America. Infection can result in fatal human disease or severe neurologic outcomes if it is not treated rapidly. The Centers for Disease Control and Prevention (CDC) says there were 22 documented cases reported in the United States between 1973–2010. Baylisascaris procyonis eggs are passed in raccoon feces and become infectious after weeks to months in the environment. Infection occurs when soil or materials contaminated with feces containing infectious Baylisascaris procyonis eggs are ingested. Young children are at particular risk for infection if they place fecally contaminated objects or fingers into their mouths or have syndromes such as pica or geophagia. Once ingested, larvae migrate through the brain (neural larva migrans), eye (ocular larva migrans), and other organs (visceral larva migrans). In a new Morbidity and Mortality Weekly Report (MMWR) published Friday, CDC reports on seven cases of baylisascariasis not already described in the literature were identified among patients in the United States from May 2013–December 2015 from several states. Oklahoma and Arkansas. In May 2013, a female, aged 31 years with a history of Chiari malformation, and who owned a pet raccoon, was evaluated in Oklahoma for headaches and generalized pain. Analysis of CSF was consistent with eosinophilic meningitis (60% eosinophils), and Baylisascaris procyonis antibody was detected in both blood and CSF. The pet raccoon was removed from the home, and the patient was treated with albendazole and corticosteroids for 3 weeks and clinically improved; however, 16 months later, she was reevaluated in Arkansas for worsening headaches, nausea, photophobia, and sensory deficits. Baylisascaris procyonis antibody was again detected in CSF and serum, and the patient was retreated with albendazole and corticosteroids. It was unclear if this episode was caused by a recurrent or persistent infection. A ventriculoperitoneal shunt was placed to correct increased intracranial pressure. She survived with persistent neurologic deficits including intermittent headaches, sensory changes on her right side, diplopia, and gait disturbances. Ohio. In May 2014, a male, aged 15 months from rural Ohio was brought to the hospital with lethargy and seizures and was found to have eosinophilic meningitis based on CSF testing. Despite the family’s report that the child had no exposure to raccoons, clinical suspicion for baylisascariasis was high, based on the elevated CSF eosinophil count, and the fact that the family lived in an area where raccoons were prevalent. CSF samples were negative for Baylisascaris procyonis antibody; however, a serum sample was positive. The child was treated with albendazole and corticosteroids and survived without neurologic complications. It was later discovered that the patient’s father hunted raccoons and stored raccoon pelts in a garage, where the child often played. Massachusetts. In December 2014, a female, aged 32 years from rural Massachusetts was admitted to the hospital with a history of rapidly progressive right-sided sensory and motor deficits and decreased ability to concentrate. CSF contained 15% eosinophils but was negative for Baylisascaris procyonis antibody; however, serum was positive. All other microbiologic testing on CSF and serum was negative. The patient was hospitalized for several weeks. Large enhancing brain lesions found on MRI completely resolved with corticosteroid treatment alone. The patient showed a marked clinical improvement thereafter. Although no direct exposure to raccoons or raccoon feces was ever reported, the patient was known to hike in rural areas where raccoons are commonly found. California. In June 2015, a male, aged 63 years from northern California was evaluated at a local hospital for a 2-week history of progressive memory impairment, loss of motor function, fatigue and confusion. He was found to have both peripheral blood and CSF eosinophilia (8% and 34%, respectively). He worked as a contractor, and his family reported that he rarely washed his hands before meals. Raccoons had been observed under his home and at his rural jobsite. Baylisascaris procyonis antibody was detected in both blood and CSF. The patient was treated with albendazole and corticosteroids for 6 weeks; 4 months after his diagnosis, he demonstrated partial recovery of cognitive and motor function. In August 2015, a male, aged 3 years from California with a history of spastic paraplegia was admitted to the hospital with altered mental status and hypotonia and developed seizures while hospitalized. CSF analysis revealed 88% eosinophils and MRI findings were consistent with meningitis. Although no direct contact or evidence of feces ingestion was observed or reported, the child lived in a neighborhood where raccoons were common. Results of testing on both serum and CSF detected Baylisascaris procyonis antibody. The patient was treated with albendazole and corticosteroids and was discharged to rehabilitation after a prolonged hospitalization. The patient suffered persistent neurologic deficits, including right-sided paralysis, incontinence, dysphagia, and apraxia. Virginia. In August 2015, a female, aged 10 months from rural Virginia was found to have eosinophilic meningitis after being evaluated for altered mental status and seizures. The patient lived on a farm with her family and several dogs. There had been a witnessed episode of geophagia. Baylisascaris procyonis antibody was detected in both serum and CSF. She was treated with albendazole and corticosteroids and survived with substantial neurologic impairment. 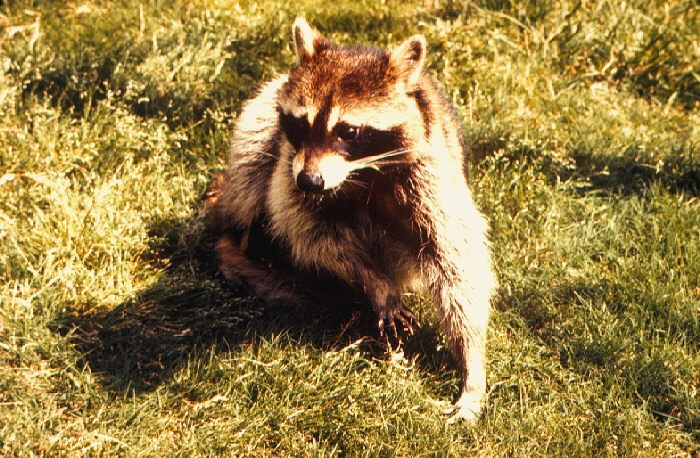 Although no specific raccoon exposure was reported, raccoons infected with Baylisascaris procyonis have been reported in Virginia. Minnesota. In December 2015, a male, aged 7 years from rural Minnesota was evaluated at an ophthalmology clinic for a 1-week history of worsening vision in his right eye. Ocular examination and retinal imaging revealed a larva compatible in size with Baylisascaris procyonis. Routine blood tests showed no evidence of eosinophilia, and the patient had no neurologic abnormalities. He lived in an area where raccoons were common. Serum tests detected Baylisascaris procyonis antibody. CSF was not tested. The patient was treated with albendazole, and corticosteroids, and retinal photocoagulation laser therapy, and had near total recovery of his vision upon completion of therapy. 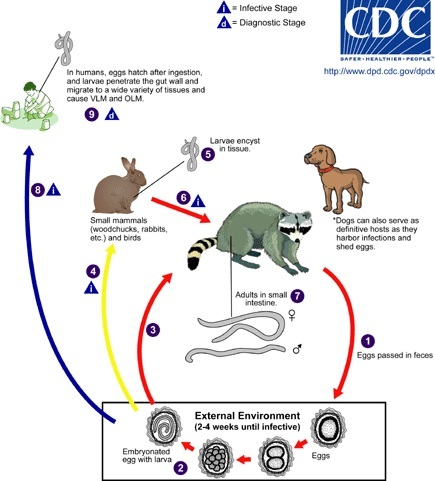 Baylisascaris procyonis, is the raccoon roundworm, is a pervasive roundworm found all through North America.infection can bring about lethal human illness or extreme neurologic results in the event that it isn’t dealt with quickly. I am wondering why baylisascaris seems to produce worse symptoms and be more difficult to treat than roundworms one might get from a dog or cat?